This is an immense book in content, well thought out and packed with information on management, care, and history. Profusely illustrated, hardcover. A simple must for any Clumber lover. Well researched, thoughtful, and insightful, this book will be of immense value to the dedicated Clumber enthusiast, the novice, and dog breeders in general. The artwork and reproduction are of an exceptionally high standard. 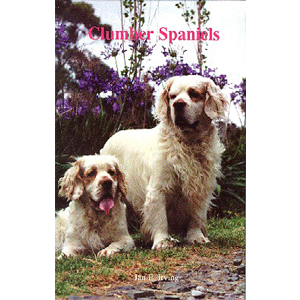 Ed Presnall (Epic Clumbers, USA) says: With this book, she has reached into the depths of her experience as a Clumber breeder, exhibitor and cherished friend of the fancy to unfold the story of the modern day Clumber, the aristocrat of Spaniels. Bill Ironside (Belcrum Clumbers UK) says: I find this book compulsive reading. The artwork and reproduction are of an exceptionally high standard and I thoroughly recommend it to all who are in any way interested in this wonderful breed.